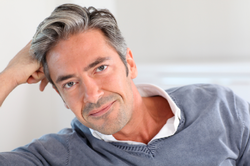 With the many inquiries we receive regarding the Hair Transplant process and NeoGraft, we have compiled a list of our most frequently asked questions. There is no such things as a bad question. If you are considering this process, call our office and ask. We will have an answer for you. Candidates for hair restoration surgery are those individuals in good health with moderate hair loss and sufficient donor hair on the back of the scalp to transplant into the balding areas. Those with more donor hair, greater hair density and fullness can typically expect fuller results. Hair transplantation is a process in which hair is taken from the back of the head or donor area and replaced in areas where hair loss has occurred. NeoGraft uses a controlled pneumatic pressure to slide out the graft smoothly, so there is no pulling or twisting which can risk damaging the graft. Once the hair follicle has been implanted into the balding area, the grafted hair will stay in place for about two to three weeks before shedding. After shedding, the new growth will begin in 3-4 months; this is normal and an important part of the new hair growth process. After that time period, the hair will continue to grow normally; your result will look healthy and natural. Transplanted hair taken from the sides and back of your head in safe areas should continue to grow the rest of your life just like it did in the donor area.